Lee University has emerged as a leader in higher education in the southeastern region. They have undergone significant growth in academic programs, student enrollment, faculty expertise, and their AV technology needs to keep up with their superior reputation. When planning began for Lee University’s new chapel they wanted to include the capability to capture and record High Definition video to be used for streaming live events, Video On Demand from their web site and capturing wedding ceremonies. Encore Broadcast Solutions was tasked to bring that vision to reality. We installed four Panasonic AW-HE100 PTZ cameras controlled by the Panasonic AW-RP655N camera controller. Lee University produces HD video using the Broadcast Pix Granite 1000 switcher for broadcast quality, live productions that are loaded with animated clips and CG graphics. 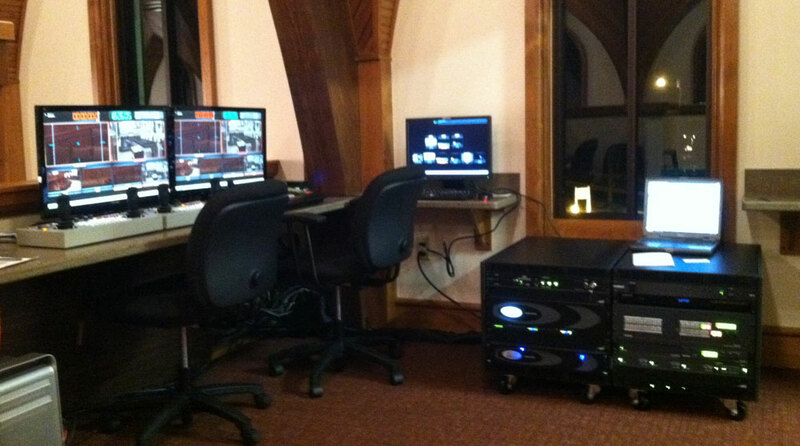 The programs are recorded on the AJA Ki Pro where the staff in the Lee University studio located across campus imports the file from the AJA Ki Pro over their LAN network for post production or duplication. Extron TouchLink LCD touch panels and control processors are used to manage the house presentation system. This includes controlling the Da-Lite Advantage tab-tensioned screens and Panasonic projectors that are located throughout the chapel as well as the audio volume for the house sound. By representing the leading manufacturers in the AV industry, Encore has the ability to integrate advanced systems using the latest technology and providing a tremendous amount of functionality and added value to the design. On-site service and training provided by Encore helps keep the system efficient and up to date. We have worked with Encore, and Glenn Bradley specifically, on several projects over the last many years. Each time we have been very satisfied with the service we received. We have learned we can always count on Encore to come through in the clutch.